Description: BNSF 5235 East with an Executive Train on Marias Pass. 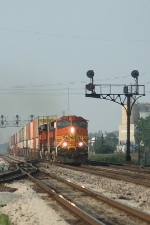 Description: BNSF 5253 leads a grain train out of La Crosse as the sun gets lower and lower. Description: Manifest prepares to enter the yard. Description: Southbound stack waiting on crew at CSX intermodal plant. 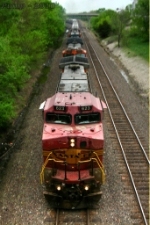 All in orange, but one warbonnet (BNSF 4718)! Thanks to a friend for the train info. Description: BNSF 4158 has ethanol empties in the modern day equivalent to the oil trains of WWII when sea transportation of oil was risky with U-Boats harassing the shorelines. It appears that fancy new mainline will knock out some of the kinks in this bottleneck area. Description: An ex-ATSF Dash-9 leads a grain train headed east at CP Gardner. Description: Heading up the hill to Cajon Pass, 1717 hours. 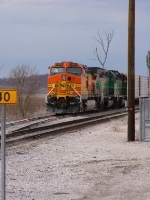 Title: BNSF 6980 teams up with bnsf 5253. Description: working dpu on this wb stack train on the plains of IL.